Since the mid-1960s, Dan Graham has received international attention for his conceptual art performances, installations, video and film works, photographs, and site-specific glass pavilions. His longstanding interest in creating interactive works that reference architecture, pop culture, and media is manifest in a large body of work produced during the past thirty years. Children's Day Care, CD-ROM, Cartoon and Computer Screen Library is the most recent project, reflecting Graham's engagement with children. Other works include Children's Pavilion (Chambre d'Amis) (1986), Children's Pavilion (a collaboration with Jeff Wall) (1988), Skateboard Pavilion (1989), Girl's Make Up Room (1997-00), and Funhouse for the Children of Saint-Janslein (1997-99). Children's Day Care, CD-ROM, Cartoon and Computer Screen Library will be exhibited in the North Gallery. This pavilion, which contains facilities for viewing CD ROMs and cartoons, and for "surfing" the internet, will function as an interactive space and library for children. In addition, young children will be entertained by the curved anamorphic "fun house" surface of the larger curved side of the pavilion, and the two-way mirrors and punched aluminum screens of the facing side, which create a labyrinth of "virtual reality." The punched aluminum gives children a "peep show" look of children on the reverse side, while the two-way mirror provides a filmic surface of reflectivity and transparency. 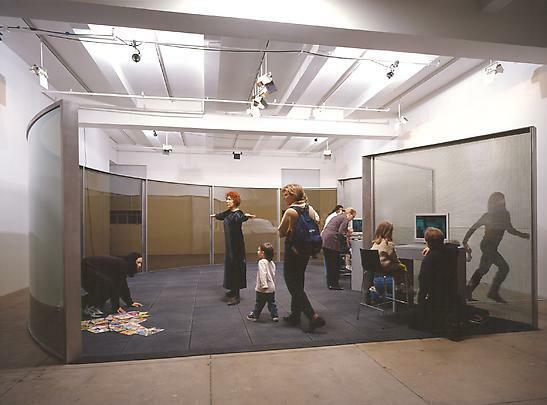 As in all of Dan Graham's works, Children's Day Care, CD-Rom, Cartoon and Computer Screen Library pavilion will engage viewers with their own perceptual processes. 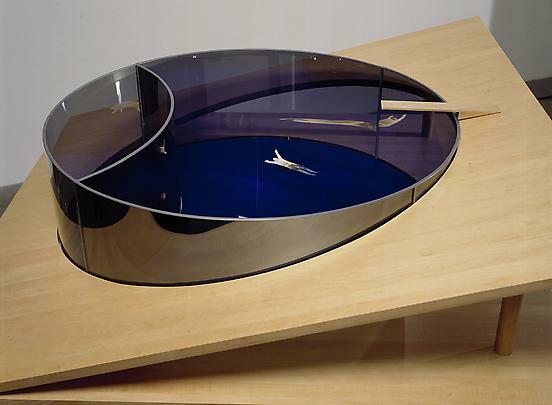 The exhibition will also present models of other new projects by Dan Graham including Yin/Yang (1997), Swimming Pool/Fish Pond (1996), and Triangle Solid, One Side Punched Aluminum, One Side Curved 2-Way Mirror (1998). 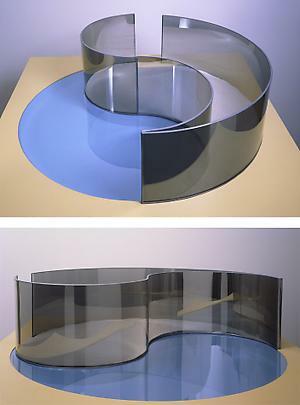 Dan Graham was born in Urbana, Illinois in 1942, and lives and works in New York City. His work has been exhibited internationally at such museums as the Museum of Modern Art, New York; the San Francisco Museum of Modern Art in San Francisco; the Whitney Museum of American Art in New York; Centre Georges Pompidou in Paris; Documenta 7, 9, and 10 in Kassel; Skulptur Projecte '87 and '97 in Münster; the Museum of Modern Art in Oxford; and the National Museum of Modern Art in Kyoto and Tokyo, among others. His recent public projects and commissions include Cylinder, Naoshima, Japan; Parabolic Triangular Pavilion, Nordhorn, Germany; Triangle: Punched Aluminum and Two-Way Mirror, Arken Museum of Modern Art, Copenhagen, Denmark; Curved Two-Way Mirror Hedge Labyrinth, Middlebury College, Middlebury, Vermont; Kiss, San Francisco Museum of Modern Art, San Francisco, California; and Heart Pavilion at the Carnegie Art Institute, Pittsburgh, Pennsylvania. Graham's work is the subject of a major traveling exhibition that will open on January 12, 2001 at the Serralves Museum of Contemporary Art, Oporto, Portugal and will tour to ARC/Musée d'Art Moderne de la Ville de Paris, Paris, France; The Kroller-Muller Museum, Otterlo, The Netherlands; and the Museum of Contemporary Art, Helsinki, Finland. A major catalog and book of Dan Graham's writings will be published in conjunction with this exhibition.